●Description: Wafer type double disc swing check valves are usedin allkinds of pipes under the pressure of PN1.6 ～ 16.0Mpa,class150-900and working temperature of –196-425 ℃ .They are mainly used to prevent the reverse flux of the media. 1. Short length, small volume and light weight. 2. Either soft sealing or hard sealing can be applied for the sealing surface according to different working conditions, both of which promise rlux of the media. 3. 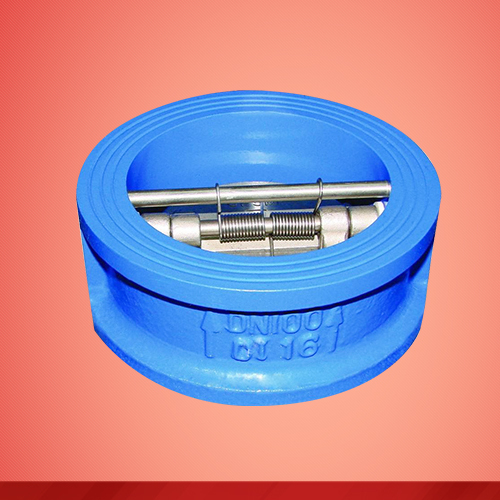 With a small starting pressure ,the valve discs can be fully opened under a very small pressure difference. 4. Fast discs closing and small water hammer pressure. 5. Convenient installation and applicability on both ievel and vertical pipes. 6. Different materials for the parts, sizes and forms of the valves surfaces are available for free com bination according to the working facts and the customer’s requirements.